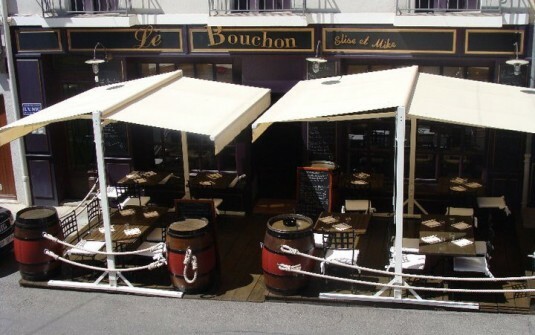 The restaurant "Le Bouchon" is located on a square in the center of Gap (parking nearby), in the Hautes-Alpes. This department of an exceptional environment very conducive to tourism, sports, agriculture, generous sunshine and unspoiled alpine scenery. The restaurant offers a refined and welcoming atmosphere in which the frame is dedicated to wine. We welcome you on a shady terrace and two air conditioned rooms. The second room of the restaurant is equipped for family dinners and birthday, business meals (projector to screen and paperboard available), as appropriate menus. The first room has more discreet tables for romantic dinner. - Market wealth, favoring local producers up: high quality fresh products, variety of seasonal fruits and vegetables. 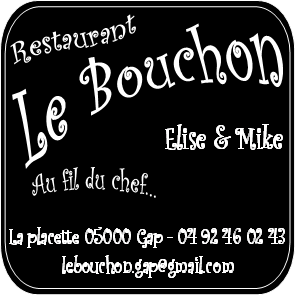 The cap is part of the Association of Restorers Masters, is adherent to the brand ALPS HIGH ... Naturellement® and directory Restaurants Who Font to Manger.fr.